THE FIREBOMBING OF TOKYO. Strategic Air Command. John F. Kennedy. Dr. Strangelove. George Wallace. All of these have one man in commonGeneral Curtis LeMay, who remains as unknowable and controversial as he was in life. Until now. Warren Kozak traces the trajectory of America’s most infamous general, from his troubled background and heroic service in Europe to his firebombing of Tokyo, guardianship of the U.S. nuclear arsenal in the Cold War, frustrated career in government, and short-lived political run. Curtis LeMay’s life spanned an epoch in American military history, from the small U.S. Army Air Corps of the interwar years to the nuclear age. LeMay: The Life and Wars of General Curtis LeMay tells the whole story of the innovative pilot and navigator; the courageous general who led his bomber formations from the front, flying the lead bomber; the brilliant strategist; the unflagging patriot; and the founder of modern strategic bombing, who was famous and notorious in turns. 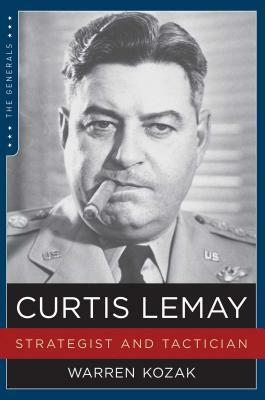 LeMay: The Life and Wars of General Curtis LeMay gives an unprecedented glimpse into the might and mind of one of the founding fathers of air power, whose influence, and controversy, continues to this day. Warren Kozak is an author and journalist who has written for television's most respected news anchors. Winner of the prestigious Benton Fellowship at the University of Chicago in 1993, he was an on-air reporter for NPR, and his work has appeared on PBS and in the Wall Street Journal, the Washington Post, and the New York Sun as well as other newspapers and magazines. Warren Kozak was born and raised in Wisconsin and lives in New York City with his wife and daughter. Visit his website at WarrenKozak.com.